Burkina Faso (/bərˌkiːnə ˈfɑːsoʊ/ ( listen) bər-KEE-nə FAH-soh; French: [byʁkina faso]) – an aa kent bi its short-form name Burkina – is a landlocked kintra in Wast Africae. It is surroondit bi sax kintras: Mali tae the north, Niger tae the east, Benin tae the sootheast, Togo an Ghana tae the sooth, an Côte d'Ivoire tae the soothwast. Its size is 274,200 square kilometres (105,900 sq mi) wi an estimatit population o mair than 15,757,000. Umwhile cawed the Republic o Upper Volta, it wis renamed on August 4, 1984, bi Preses Thomas Sankara tae mean "the land o upricht fowk" in Mòoré an Dioula, the major native leids o the kintra. Figuratively, "Burkina" mey be translatit, "men o integrity," frae the Mòoré leid, an "Faso" means "faither's hoose" in Dioula. 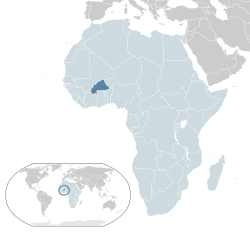 The inhabitants o Burkina Faso are kent as Burkinabè (pronounced /bərˈkiːnəbeɪ/ (deprecatit template) bər-KEE-nə-bay). Burkina Faso wis populatit early, atween 14,000 an 5000 BC, bi hunter-gatherers in the northwastren pairt o the kintra. Settlements wi farmers appeared atween 3600 an 2600 BC. The central pairt o Burkina Faso includit a number o Mossi kinricks, which became a French protectorate in 1896. Efter gainin independence frae Fraunce in 1960, the kintra unnerwent mony governmental chynges till arrivin at its current form, a semi-presidential republic. The current preses is Blaise Compaoré. Burkina Faso's caipital is Ouagadougou. It is a member o the African Union, Community o Sahel-Saharan States, La Francophonie, Organization o the Islamic Conference an Economic Community o Wast African States. ↑ André, Géraldine (2007-05-31). "École, langues, cultures et développement". Cahiers d’études africaines (in French). 47 (186): 221–247. doi:10.4000/etudesafricaines.6960. ISSN 0008-0055. ↑ "Burkina Faso population projection". insd.bf (in French). 2014. Archived frae the oreeginal on 1 September 2014. Retrieved 1 October 2014. ↑ CFA Franc BCEAO. Codes: XOF / 952 ISO 4217 currency names and code elements Archived 7 Apryle 2014[Date mismatch] at the Wayback Machine.. ISO. This page wis last eeditit on 2 September 2017, at 01:45.